At Experience Better Golf we focus on the development of juniors players regardless of age or skill level. Our programs offers a diverse range of options depending upon the goals of each junior, and we always strive to make golf FUN! These camps are not only for the newbies, but the elite and advanced that have had experience in the game. New friendships are made by kids from all ages in the Summer Junior Camps. Juniors receive instruction at their own speed and interest. The age breakdowns are 5-7, 8-11, and 12-15. Within each age group the juniors are divided into groups of four with one instructor to work on similar skills. To reduce anxiety and increase focus, the beginners train with beginners and the more experienced students train with their more experienced peers. At the end of each day, all juniors play together so the experienced players have the opportunity to mentor the beginners. Each camp ends with a golf tournament in which parents are challenged to be their children's coach and caddie for a specially set-up course on the beautiful fairways. The academy has been teaching these programs for over 10 years now and still continues to grow today. Juniors start in a similar age and ability. They graduate with ability not only in golf skills, but athletic ability as well. As they enhance there golf and athletic ability, they work their way up in a step by step program that is similar to colored belt system used in Martial Arts. We are excited to bring this 9 hole junior tour to Bay County. Designed to be a simple, fun, and a safe entry level tournament style event to get the juniors introduced to competitive golf. There are three age groups divided into boy and girl divisions, ages 5-7, ages 8-11, and ages 12-14. The entry fee of $30 includes green fee, cart, hot dog, chips, drink, as well as the trophy to take home. The philosophy that the Adam and his staff take when working with junior golf participants is one of posture, setup, grip, and a balanced swing with a properly fit club. If the club is too long, short, heavy, light, or insufficient loft, then the golfer is forced to try to make a motion that is fundamentally incorrect. This swing can be detrimental as it can effect balance, ball flight, and length which can discourage any young golfer to potentially quitting the game. U.S. Kids Golf is based out of Atlanta and offers junior equipment from the youngest to the oldest in ultralight series as well as tour series for the more advanced golfer. Henry Griffitts has a great approach to junior equipment. Buy one set of clubs and HG will refit your juniors shafts and grips two more times as they near adulthood. This program is to create an athlete as well as the golfer. If you can run fast and throw far, you hit the ball further, if your hand eye coodination is good, then you hit the sweet spot more often, if you have touch, you will work magic with your wedges and putter. This program is instilled into everyone of our junior coaching programs and promises to improve everyone of our juniors. With this Kindergarten - 9th Grade program, this is an investment that ensures an athletic golfer with a high school/ collegiate/ tour player goal in mind! Adam and his staff are certified / trained at Starting New At Golf (SNAG). SNAG is a coaching system in which students of all ages learn the game. By it's design, it is able to articulate the simplicity of the game and visually instructs the player to strike the ball with a consistent and repeatable swing. SNAG is an over sized club with a velcro ball/ target system to get rid of any anxiety that might start with the newbies. One of Adam's passions in the game is to coach high school golf teams. The coaching doesn't stop with the high schoolers, but continues with how to help the coaches keep an eye on what to look for in his or her junior golfers. Adam goes over curriculums that are proven to produce lower scores that takes schools all the way to state matches. He then helps individuals all the way to college scholarships. He has been blessed to work with kids that have full scholarships to division 1A schools. Adam continues to see his junior players play college golf with scholarships all over the country. When they return for summer break they help teach our summer camp programs and work on their games. Adam's academy offers two internships every year at the academy. Social media, technology, teaching, fitting, and the everyday operation that take place with an academy that continues to grow every year. The First Tees' mission is to impact the lives of young people by providing educational programs that build character, instill life-enhancing values and promote healthy choices through the game of golf and the Nine Core Values. Thank you so much for making our season so successful! We couldn't have done it without you! Thanks for a great event. My children had a blast. They loved playing with kids their age. As we finished the last hole and made our way back to the clubhouse, my son said, This is the best game ever! We would love to be part of the tour each month. When will the next event be posted for us to sign up. The kids are already asking me. Thanks again for organizing structured golf for the kids in our area. Thank you very much for your help with Hunter. Yesterday, his self-esteem was greatly elevated. I just wanted to give you and your staff kudos for a great experience today. I hate to say that I wasn't at all sure Parker was learning anything on Wednesdays but today really opened my eyes as to what kind of job you folks do with these kids and what kind of experience you are now providing for them as well as many others who participated. Parker talked about it right up until when he closed his eyes and the last thing he asked me was if you were going to be doing that every Sunday lol. Thank you again for an amazing afternoon and for sharing your knowledge with my child as well as all the other children that they can use for the rest of their lives. A goal is to get more kids playing golf to feed the Emerald Coast Junior Golf Tour, the high school teams, and ulitimately collegiate golf. Another goal is to have more family time, getting our juniors away from their "screen" time, and hanging with other juniors in the community. We had created two junior tour events 7 years ago and they were a huge success; called the October Open and the March Masters. They were full events and there was a huge need for organized junior golf events. However, with my teaching in Japan and having a young family, the time required was too much to bear. Now in 2016, there still hasn't been anyone that has filled the lack of an organized junior golf organization. My daughters are now 6 and 10 and I have cut international travel back to be at my academy and home in Panama City Beach, FL. By the way, the best place to live in the world! Rachael Switzer, Anika Story, and David Cantu have joined the EBG family. As such, we now have the tools and talents to put on an amazing family junior tour. 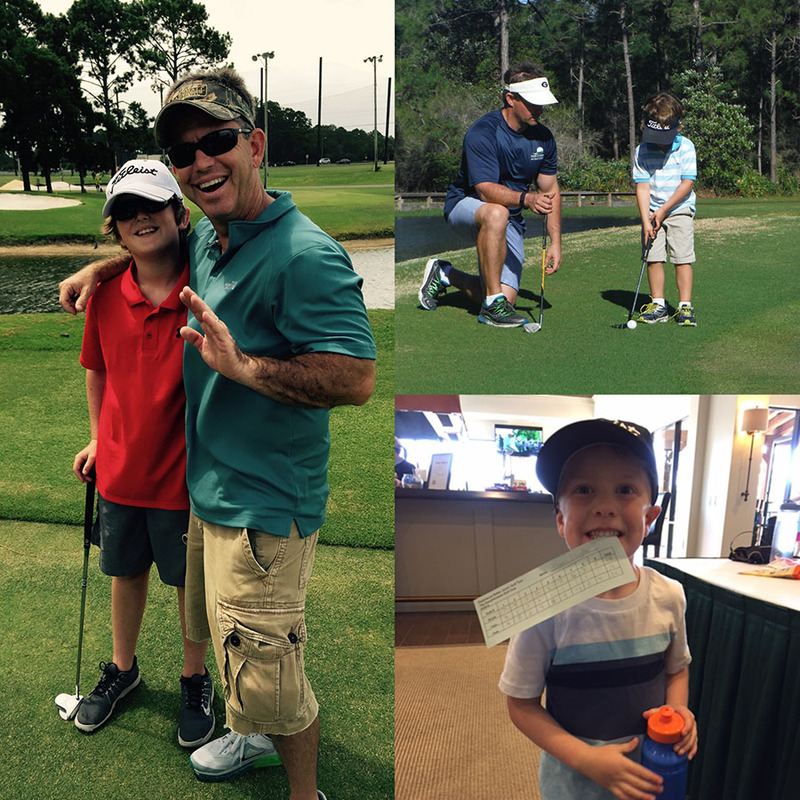 The mission for our golf instruction program and Junior Tour has come from my heart. God, my family, including past generations, have had a passion for families playing together. With the current drive for technology, this generation is going through, the "screen time" and has started to remove something that has kept families connected as well as the outdoor activities and athleticism that keeps juniors healthy. The EBG Junior Programs fills both of these facets; family time and playing outdoors. I get emotional at every event that we've hosted so far. This Tour is designed to be a feeder program for the Emerald Coast Junior Golf Tour, Red Hills Junior Tour, Future Masters, High School Golf, and eventually to Collegiate Programs. Some of our great testimonials have been Cameron Fish and Lindsey Harrison! The short history of our tour is this. Since we began this tour in April of 2016, we have now held 5 events. The first was a trial run expecting 10-12 kids. The event was one shy of "full" with 26 juniors. We do a 27 junior cap with a 9 hole event. This dynamic allows us to be off the course in less than 2 hours, which is a huge factor in keeping the kids engaged while still having fun-rather than burned out. We close the event with certificates for their recognized improvements and graduation. (We now include the traditional hot dog, chips, and drink with the junior's entry fee of $30). Since April, our tournaments fill up in just a few hours to a couple days and have a waiting list. As our waiting list has grown, we plan to have a second event per month established by 2017. The tour now has 5 to 15 year olds from Callaway to Ft. Walton. The last two events have had over 80 people attending, including participants, caddies, parents, grandparents, siblings, and friends. The golf courses have had amazing feedback and are excited to have us back. We can give you a list of referrals and testimonials as well! We are so excited about the future of junior golf in our area and are sure to have some amazing stories over the years! We are excited about you joining the "Experience Better Golf" Family!